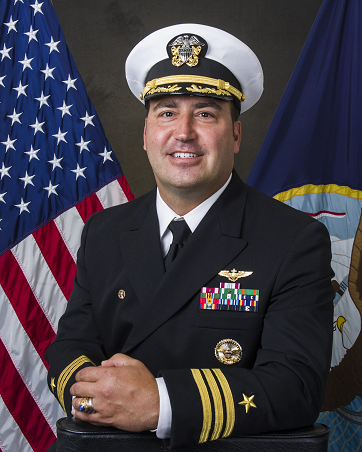 Commander Brannon S. Bickel, a native of Massillon, OH, graduated from the United States naval Academy in 1997 with a Bachelor of Science degree in English. He completed flight training, and was designated a Naval Aviator in February 1999. CDR Bickel’s sea duty assignments include tours in USS BOONE (FFG-28), USS ROOSEVELT (DDG-80), and USS GETTYSBURG (CG-64) while assigned to the Vipers of HSL 48. While assigned to the Battlecats of HSL 43, he deployed in USS HOWARD (DDG-83) and USS RONALD REAGAN (CVN-76) and served as the squadron’s Operations Officer. He commanded Easyriders of HSM-37 from June 2014 until July 2015. During his command tour, HSM-37 was awarded the COMPACFLT Retention Excellence award for 2015, SECNAV Safety Award and Phoenix Award submission in 2015, and the CNAF Battle “E” for 2013 and 2015. Between sea duty assignments CDR Bickel completed an instructor pilot tour with the Seahawks of HSL-41, served as Flag Aide to Commander Naval Air Forces, and was the Military Assistant to the Under Secretary of Defense for Personnel and Readiness in the Office of the Secretary of Defense. Most recently, he served as the Helicpter Commander Detailer (PERS-431B) at Naval Personnel Command in Millington, TN. CDR Bickel earned a masters of Science Degree in Strategic Studies and National Security from the Naval War College in Newport, RI, while assigned to the College of Naval Command and Staff resident program. Commander Bickel has accumulated over 2,400 flight hours in Naval Aircraft. His personal decorations include the Defense Meritorious Service Medal, the Meritorious Service Medal (three awards), Navy Commendation Medal (two awards), Navy and Marine Corps Achievement Medal, and various unit awards.